Below is the player-facing design document for the Bank Rework. It is an edited version of the original design overview that we made for the project. Please let us know of any feedback about the design. We will be of course be available on the thread, reddit and Twitter but we want to make sure that you know that we're listening to feedback. I will be posting responses to feedback and answering questions on 13th, 20th December and 3rd, 10th and 17th January to be sure to check back then. I'll update this post with a link to these posts so just check back if you want to get involved in feedback! First feedback post here! - Bank space, subtabs, POH items and more! Second feedback post here! - Potions, multiple stacks, preset icons and more! Third feedback post here! - Presets, deleting items and name of the bank! The RuneScape Bank is one of the most important systems in RuneScape, you interact with the RuneScape bank multiple times on a daily basis, a vast majority of skills requires a bank in order to be trained at all and is an iconic part of the RuneScape gameplay. For all of these reasons, we need to be incredibly sure that we improve the bank's usability, display, functionality and features while keeping true to the identity of the current RuneScape bank. To that end, we want to get you involved. We want your feedback on everything that we’re proposing. This document is the first step, and we want to see your thoughts on the official threads on forums, reddit and Twitter. We will then outline the changes to this design, based on your feedback, in a RuneScape Dev Diary about the Bank Rework in the coming weeks. Look out for that! All of the below information is what we're designing and aiming for. Not everything will make it but we wanted to share as much about the design as we can right now. This is what the Bank rework is looking to achieve. These aims are created for every major project, and are usually only released internally. When writing a design for something as large and critical to the game, it is important to have a vision and stick to it throughout your design. This is the statement to make sure that we hit our project aims and deliver a bank rework that everyone will enjoy. A reworked RuneScape bank should have the same visual style and interaction as it does currently. New features should be implemented without adding friction to the user experience, and nothing should be added for the sake of it: everything should be building a better bank. Part of the rework includes reassessing the layout of the bank but not just for the sake of it. This does not mean a complete redesign of how the bank looks or feels. It’s important that the RuneScape bank feels familiar. There are many of the new features that we're looking to implement to the bank that will need to be visible from the main bank screen, primarily presets, sorting features and incorporating the inventory and equipment screen. It's important that you shouldn't have to spend 2 hours relearning where everything is. These features are taken from many different threads on the forums, reddit and other avenues. Thank you so much for your help in designing these. The features listed below are prioritised in collaboration with you. The number one requested update to the bank of all-time. Most people have a very strictly arranged bank or, at the very least, have tabs for certain gear. When a player wants to take out their expensive PvM equipment, the bank collapses itself and moves everything around. This can be frustrating to anyone who has their items in specific places for cosmetic reasons, or want to know where something is at a given time. Bank placeholders are a simple concept, in that whenever a player withdraws the last from a stack of items, that item stays in place at 0 quantity. This means that the bank doesn't shuffle round, and the item appears as if it is still there. When I go to deposit the item, it will ‘replace’ the placeholder, wherever that placeholder is. In addition to the above, you will be able to put the same item into multiple tabs. This means that if you want to have a Woodcutting and Fletching tab, you can put the same placeholder of elder logs in both tabs. We all love to keep organised banks, whether for aesthetic or organisational purposes, but we've never given you the tools to sort it efficiently. We're planning to add auto-sorting options and some organisational tweaks to allow quick sorting of banks and some much needed customisation. There are a huge number of different sorting options that we want to give you: automatically sorting a tab based on the level required to make/wear/use; sorting by GE value; sorting by quantity; sorting by a custom setting; tabs to be marked to only accept certain item types; and to designate tabs as ‘loot tabs’ for quick valuation (and taking a good screenshot), and when using auto deposit features like the Pack Yak scroll and Sign of the Porter. We're also adding the Wise Old Man's bank cleanup as an option inside the bank itself, meaning that it should be easier and quicker for you to free up bank space. We're also going to be updating this service so that it is easier to use and includes up-to-date items. While we won’t be offering unlimited bank tabs, it's pretty darn close. Someone, somewhere will hit the limit, but we're planning to give you a far greater number of tabs. We want to make sure that everyone can have a bank tab for every single skill in the game, for every boss-monster’s loot tabs, for cosmetic items, for essential items, for you to customise and do what you like with. The bank needs to be more flexible to accommodate the many different ways of playing RuneScape, and that is what we plan to provide. 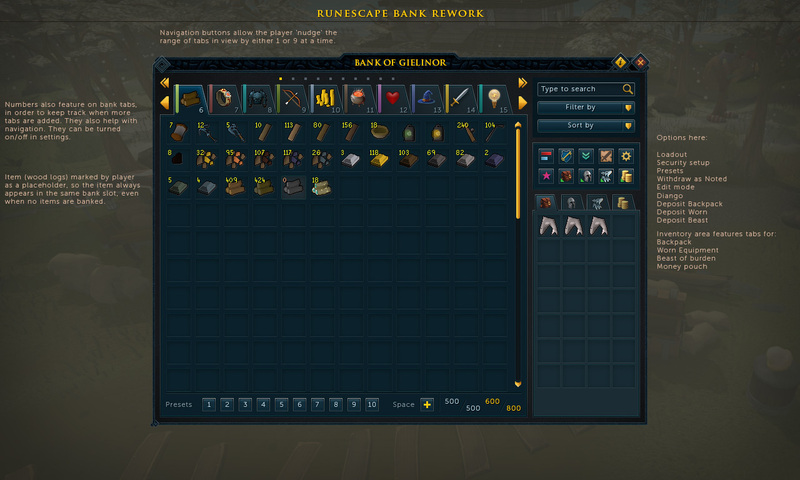 We're making it so that bank tab icons no longer need to be the first item in the bank. You will be able to select any item in the game to be your bank tab icon, even if you don’t own that item. You will even be able to choose skill icons for your tabs, for quick identification. Searching hasn't really changed since its implementation, but we can improve on it and add features that you are used to encountering on internet search engines. We can display search results in a window that doesn't disappear when you interact with it, and we can offer clearer information on searched items. Meta-tagging is when we attach keywords to an item, other than the item’s name, that can be searched for. This is similar to the Grand Exchange categories, but instead of selecting a category, you will be able to search for it. For example, searching for ‘food’ in your bank will bring up all items that have the ‘food’ meta-tag, which will be all items that could be eaten to restore health. Now imagine this across weapons, armour potions, etc. Presets have become a staple part of the bank since their introduction in 2014 and we're looking to update them as part of the Bank Rework. We'll be performing a bunch of Ninja fixes to them, as well as a ton of behind-the-scenes reworks that will help us deliver key features. We are in the process of seeing whether we can add more presets, as well as Beast of Burden presets, in the technical design. It’s something that we want to do, but comes with a significant technical cost. In the not too distant past, Diango was a simple toy salesman, but recently he has held the responsibility of holding onto all reclaimable items. Travelling to Diango or his brother in Prifddinas is far from a perfect system, so we're going to let you do this at your bank. If you want to do a bit of Cooking at the portable range in Lumbridge, but need to reclaim your outfit, you can now do so from a bank chest. It can be frustrating when the bank shuffles around after adding or removing an item. This has been a problem for years, but we will be giving you the option, as a part of a new suite of Bank options, to change your shuffling mode. By default, it will work as it does now: if you withdraw an item, all of the other items will shuffle up. You will, however, be able to toggle to the ‘Old-School’ version, where items do not shuffle until you close the bank. As part of this, we will be introducing a ‘Bank Edit Mode’ where you will be able to customise your bank, set placeholders and do cosmetic changes to your bank without worrying about messing up your presets or accidentally withdrawing items. The bank is a screen that you look at often, it's a place to gear up ready for combat, a place to store all of your valuable materials and good as well as a place to train on a plethora of skills. It is for these reasons that we are adding some cosmetic features to the bank such as being able to change the colour of tabs, being able to rename tabs and much more. With the current bank, as far as the game engine is concerned, the bank inventory is no different from the regular inventory, where all of the rules for how content such as bank tabs, non-bankable items and other special cases work are handled by our scripting language, RuneScript. This gives our developers a lot of control over the finer details. However, critical portions of the core interactions were built a long time ago and had much more restricted functionality - resulting in expensive code which is increasingly difficult to maintain and build on. One of the more important things we look at from a technical perspective is what code the game servers are running. We have information such as the total amount of time each script takes to execute and how many times it’s used which we can use to generate lists of the most expensive code. We have well over a hundred thousand individual scripts and the current bank system appears in the top 200 list 9 times in total. One of our key development aims with the bank rework is to work directly in the game engine to provide support for all of the new features we wish to add, while completely rewriting the RuneScript from scratch. This should give developers as much control as possible while allowing the game engine to directly handle much of the strain. This will ultimately allow us to add the new features listed in this document while making the system much more maintainable for us and severely reducing the amount of script! This looks phenomenal. If you can even accomplish a couple of the things on the list, I'll be thrilled. Could you please add a way to easily identify members items, and free items... So that it is easier to change from a members to a free account, and to help with clearing out items for bank limits. One question that hasn't been answered in the document: Will there be more bank space at all? You said that you want to improve the Wise Old Man System but I suppose that it only includes Quest Items? We got a lot of items with the Arc for example and there will be more items with the release of Menaphos probably so it would be nice to have more bank space. I think quest items is a big issue, I've got all these quest items and i'm not sure if i'll need them again for sequels. I've made that mistake before, discarded a quest item which I then need for the next one. This update will be great! Thanks dev team!